From 25 May to 8 June 2018, the 7th International Latgale Graphic Art Symposium of Daugavpils Mark Rothko Art Centre will bring together ten graphic artists from Poland, Portugal, Greece, the United Kingdom, Finland, Estonia, Latvia and even Brazil. The seventh iteration of the International Latgale Graphic Art Symposium is once again organised by Daugavpils Mark Rothko Art Centre in cooperation with Art Teachers’ Union within the framework of the centre’s residency programme. Growing and developing over time, the symposium has become a substantial regional platform that enables graphic artists to meet and exhibit their work. Year after year, interest in the symposium continues to increase, attracting a steadily growing number of applicants. Hopefully, the influx of globally recognised graphic artists into Daugavpils will inspire the new generation of locally based graphic artists who, with varying levels of scrutiny, follow the symposium and its outcomes, seen in the Rothko Centre’s artistic projects in Daugavpils and elsewhere. By tradition, in the course of the symposium, artists create graphic sheets in letterpress and intaglio, which are added to the Rothko Centre’s graphic art collection. 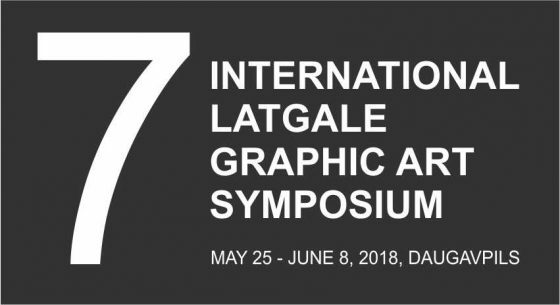 The following artists were selected for the 7th International Latgale Graphic Art Symposium by an international jury: Lembe Ruben (Estonia), Inese Lieckalnina (Latvia), Oksana Vronska (Latvia), Jolanta Gmur (Poland), Mariana Rebola (Portugal), Fernanda Pompermayer (Brasil), Yasmina Hamaidia (United Kingdom), Yanna Kali (Greece), Outimaija Hakala (Finland), Joanna Paljocha (Poland). An exhibition of artwork created in the course of the symposium will open at 4 p.m. on 8 June 2018 on the ground floor of Latgale Central Library. The exhibition will be publicly available free of charge until 24 June. Participants of the symposium will also add to the Art Night programme with creative workshops near the Rothko Centre, which will run from 10 p.m. to midnight on 8 June. Supporters: Daugavpils City Council, State Cultural Capital Foundation, Latgale Region Development Agency, Joint Stock Company “Latvian national forests”, Valmiermuiža Brewery, Caparol.